When I was little, I was afraid of fire. I had nightmares about being trapped in burning buildings. Pulse terrified me, even more so than It. I wasn’t scared of being burned- I had my share of encounters with a hot soldering iron or an overheated BJT. I was scared of fire’s power to consume everything I had and everyone I loved. It seems oddly appropriate then that everyone these days has been calling me a pyro. Sure, I like candles, and I have far too much fun with that butane torch. I like campfires, but who doesn’t? I loved welding in high school metal shop. Well, maybe I should admit to having some fascination with fire- because the Infernoptix Digital Pyrotechnic Matrix is one of the coolest things I’ve ever seen. It’s a single device that combines my latent pyromania with my love for unconventional display devices. 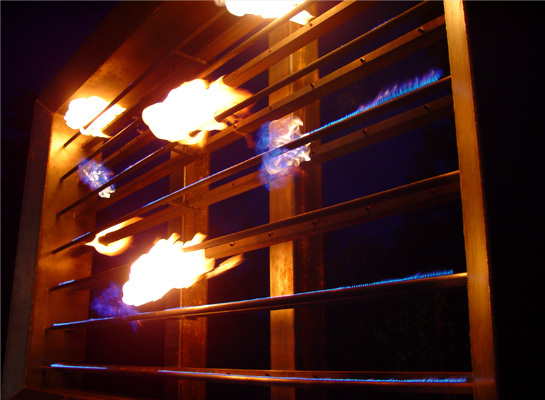 Their current design is a 12×7 matrix of valves which appear to be capable of producing fixed-size bursts of gas just behind a panel of pilot lights. They mention plans to extend the design to variable-size bursts and to include colored flame. This got me thinking about the scalability of pyrotechnic display devices. The problem is really the valve-per-pixel nature of the design. Just like how early active-matrix displays were limited by the expense of including a transistor per pixel, these displays must include an expensive valve and nozzle for every single pixel. The display could be made much more economical if some method of multiplexing were employed. This could be mechanical multiplexing, chemical, etc. My fascination with mechanically scanned displays has suggested an interesting design- picture a thin disc, spinning at a constant high speed. The rim of this disc has a small number of nozzles, perhaps only one or two. Concentric with this disc is a larger disc with pilot lights pointing inward. The nozzles on the rotating inner disc are controlled by very high-speed valves. A fan below the whole assembly provides a relatively constant flow of air upwards. This produces a cylindrical display in which a single high-speed gas nozzle traces a helical pattern across the display’s surface. The high-speed disc provides angular multiplexing while the vertical motion of air provides a continuously scrolling display surface. This entry was posted in Technology and tagged display technology, pyromania on May 27, 2006 by Micah.